A Houston-area woman has built a three-story "female man cave," which houses hundreds of thousands of dollars in designer duds and a champagne room. Woodlands resident Theresa Roemer had a dream. She longed to one day the proud proprietor of the closet of her dreams. And now, for this rich lady from Texas, that dream has come true. The three story closet Roemer built in her home boasts a champagne room on the second floor, as well as her collection of Christian Louboutin. Oh, how I long for the day when I can invite a camera crew into my closet and say "here is the Hermes section." 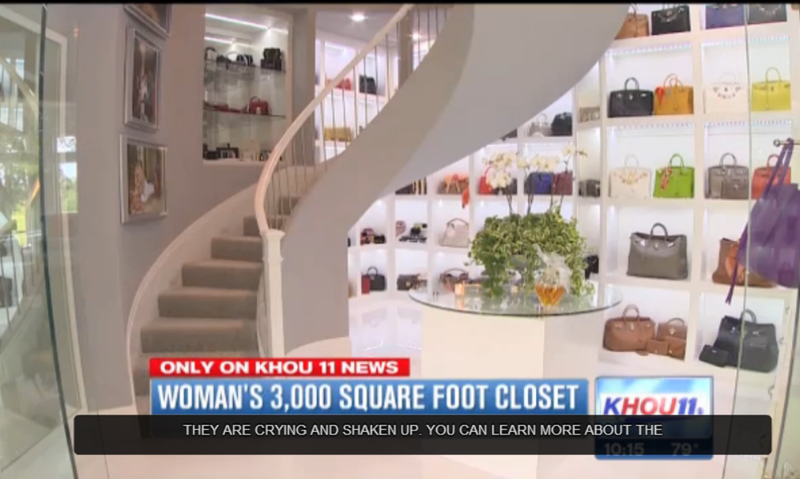 She told KHOU the closet was built for fundraising, so don't be a hater, OK? Roemer has only been in her new home a few weeks, but she's already hosted a fundraiser in her closet that's netted tens of thousands of dollars. And recently a party in Roemer's closet was a featured auction item at a fundraiser for the American Heart Association. For years, Roemer has raised millions for places like Texas Children's Hospital and Child Legacy International. "Hey, where are you going on Saturday?" "Oh, to a party in some rich lady's closet."